It’s tough to argue with Ben’s point, but as it turns out, a spike in searches around the two most significant events of tax season in the U.S.—the availability of W-2 forms and the due-date for federal tax returns—are pretty dependable as well, as search volume increases in January/beginning of February and in early April. Like other years, users have been looking for info on the process, places to turn for help, and service providers to get their taxes done. 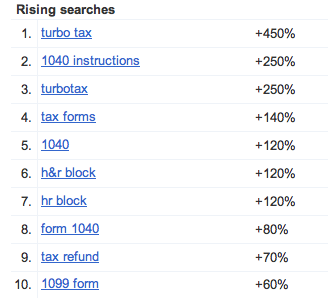 As expected, in the “Accounting & Tax” category, the fastest rising searches since mid-January include both commercial terms like [TurboTax] and [H&R Block] and government-specific terms like [IRS forms] and [1040 instructions]. Americans looking to file their taxes in advance aren’t the only ones searching for information on the subject; the last-minute filers have been searching quite a bit as well. In recent weeks, as the deadline has approached, searches for terms like [tax extension] have shot up. Elsewhere, tax filers from around the country are increasingly looking for ways to complete their taxes online in 2011. This year, searchers in North Carolina are leading the way in [do taxes online] followed by Missouri, and Pennsylvania. During tax season, professional accountants aren’t the only ones that get consumed with tax preparation. Proof that Americans get seriously tax-obsessed: in the last week, folks have been searching more for tax info than for that other seasonal fixation, [american idol]. But no matter how consistent tax-related queries tend to be, the 2011 calendar features a wrinkle: in observance of Emancipation Day on April 15, the IRS has extended the deadline for federal returns to Monday, April 18. If you thought you were the only one who didn’t know that, you’re not alone: The deadline change has prompted quite a bit of action for [when is tax day]. Of course, taxpayers have been keenly interested in how they can save on taxes. For example, [American Opportunity Credit] searches have increased substantially from last year. More creatively, some Americans are looking to maximize their refund by documenting their financial activities of the past year. For some, that means looking at the monies that they *gave away* in one way or another. When it comes to taxes, perhaps vices trump good. Case in point: Like in past years, searches for [gambling losses] are currently besting those for [charity deductions]. For a view into what truly enterprising taxpayers have managed to claim in past years, see this list of deductions that have been actually been approved. Do you think we might be able to claim a deduction for our lava lamps?